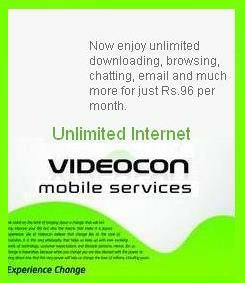 Videocon Mobile Services who is pioneer in bringing damn-cheap Own-Net Special Tariff Vouchers, has withdrawn the True Unlimited GPRS Packs in all telecom circles. Recently company also put the FUP on some popular voice Voice STVs for Own Net and STD calls in all circles. At a time of launch Videocon offered RCV 96 for Unlimited GPRS/ Mobile Internet till 30 days and got Maximum Number of Popularity. Now the operator have withdrawn its “True Unlimited GPRS” offer, not totally but putting FUP/CAP on them by following the same policy of its On-Net calling and STD packs. Now GPRS Pack of Rs.5 comes with 35 MB Data Cap, Rs.13 for 500 MB, while Monthly pack of Rs.96 will provide Free Data Usage up to 6 GB only. when videocon will come to goa?